The standard bullet for a list is a simple black dot, and is perfectly adequate for an understated list such as that you may use in a business document. However if you want to be a bit more creative there are a couple of ways to customise the appearance of your bullets. 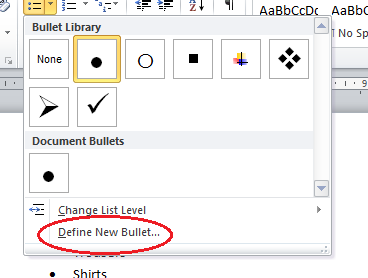 Click the arrow in the bullets button, and select a new bullet style from the menu. Using the new Live Preview feature you can see what the new bullet style will look like before you commit to the changes. 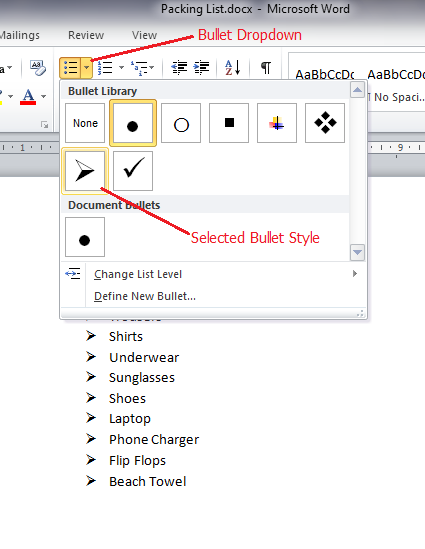 If you want to use something a little different to the standard set of bullet options, it’s possible to use something from the symbols menu, or even your own picture. With the cursor in your list activate the Home tab. click the arrow on the Bullets button. Select ‘Symbol’ as the the bullet type you want to create. Select an image to use from the dialog. Click ‘OK’ to preview the new style. Click ‘OK’ again to apply the new style. You can design your own Bullets and import them in to you document by using the ‘Picture’ button, but remember your images must be small as Bullets are usually 13 x 13 pixels.